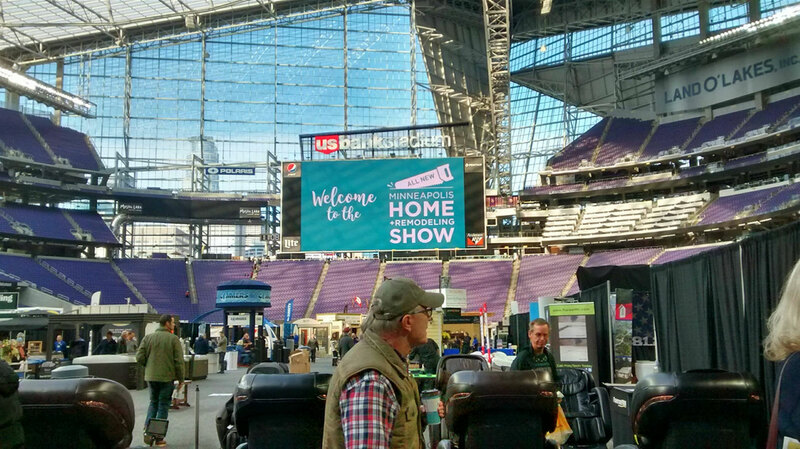 The Minneapolis Home & Remodeling Show is the first major home show of the home show season and is held in the US Bank Stadium on February 16-18, 2018. Be sure to go to the Home & Remodeling Show website for discounted tickets and then stop by and see me in Booth #1329. The home show season is typically kicked off in January and then runs through early March. However, because of the Super Bowl, the major home shows are delayed several weeks, if not more, and the schedule becomes more condensed as everyone tries to hold their shows before spring arrives. This means that after the Super Bowl, there will be five major shows from the middle of February through early April so get ready for a busy home show season! This show was a newcomer to the schedule in 2017, but it made a big splash, welcoming almost 30,000 visitors. It is run by the same organization as the Minneapolis Home & Garden Show and covers the latest products and services in home design and construction. The exceptional quality of the exhibitors will ensure it will be a great resource for creative inspiration and helpful advice for all of your home improvement projects. You will find architects, interior designers, builders, and much more. You can also catch plenty of presentations and live demonstrations at the Main Stage, featuring local and national experts in home improvement, architecture, remodeling, décor and more. Karl Champley will appear in 2018 on the Main Stage Sponsored by Slumberland Furniture on Friday, February 16, Saturday, February 17, and Sunday, February 18. Karl was the host of the award winning shows DIY to the Rescue, Wasted Spaces and Home & Family on HGTV, DIY and Hallmark Networks. He has hosted over 300 episodes viewed in over 100 million homes in the United States and is seen in Canada, Australia, Hong Kong, New Zealand, Turkey and several other countries around the world. Both of his home improvement shows “DIY To The Rescue” and “Wasted Spaces” have won 7 Telly and Aurora awards. Karl was the winner of Ellen’s Design Challenge with Ellen DeGeneres. Reaching the highest viewership HGTV had ever experienced. If all that isn’t enough, the stadium is cool, and your view of the Minneapolis skyline is worth the trip on its own. To make it easier to attend, Metro Transit is providing free light-rail and bus rides to and from the show all three days.